Pada tanggal 26 Oktober 2011 Nokia meluncurkan sebuah handphone Nokia Asha 303 dengan Hardware/Processor CPU 1 GHz processor, Dimensions (mm) 116.5 x 55.7 x 13.9 serta berat 99 mg membuat Nokia Asha 303 tampak ringan dan ramping. Nokia Asha 303 menggunakan ukuran layar 2.6 inches , 320 x 240 pixels. Camera yang digunakan 3.2 megapixel. 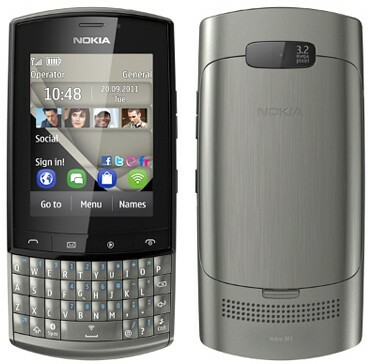 The Nokia Asha 303 is a stunning phone designed with sophisticated materials and metallic finishes. It combines a large 2.6" capacitive touch screen with a high quality QWERTY keypad. The Nokia Asha 303 is built with Internet and social networks ease in mind. The device harnesses a powerful 1Ghz engine, 3G and WLAN to deliver a fast Internet experience. Social networks, email and IM are at the center of the experience, easily accessible from the homescreen. The Nokia Asha 303 is powered by the cloud-based Nokia Browser, which by compressing the web by up to 90%, provides higher speeds and a more affordable access to the Internet.